Did that headline shock you? It shocked me to write it and admit it because I’ve been claiming for years now that my 5-year old is completely bilingual. I mean, we’re doing everything right, or at least we were for a while. First let me tell you why and how I realized she’s not as bilingual as I thought and then I’ll explain where I think we messed up. Fisher-Price invited Roxana and I to be one of their Play Ambassadors and, as such, we have some trips we’ll be taking with them during the year. One of the trips is a visit to the Azul Beach, a Karisma hotel in the Riviera Maya, to learn how children reach developmental milestones around the world and in different cultures. I took advantage of this opportunity to arrive a few days early and bring my daughter with me to Cancun to visit my sister-in-law, her husband and my niece and nephew — Camila’s primos. The trip was long overdue since we hadn’t seen them in two years and had only kept in touch through Skype and such. Of course, I was super excited because this would mean Camila would not only get to nurture the bond with her primos, but also to polish her Spanish the week before starting kindergarten at the dual immersion program she was accepted into. Even more so since the last month we’ve been talking so much about her new school and how it will be mostly in Spanish. She always seems excited and eager, but then, randomly, she’ll spill out that she doesn’t know how to speak Spanish, that she prefers English. I deny it. I insist that she speaks Spanish very well and that she just needs to practice it. She responds that she doesn’t know it that well and that she mixes too much. I keep insisting it’s okay, and that she just needs to practice and not be afraid. I honestly thought that as soon as we got to Mexico and she was surrounded by her primos she would switch that imaginary Spanish chip on. It’s been two days and it’s not turning on. Camila and her primos had an immediate connection, especially with her prima who is only three months older than her; they’ve been inseparable and loving to each other. The way the relationship is developing is that Camila speaks to them in English and they respond in Spanish — just like what’s been happening at home. They kinda understand English and Camila understands Spanish perfectly, so there’s no real need for her to speak it. I’ve nagged a bit with the “Aquí hablamos español” and such, just like I did last year when we went to El Salvador, but it doesn’t seem to be working this time. Plus, I don’t want to force it on her at all. I do see her trying and she’ll throw words in Spanish here and there, but the truth I’ve had a hard time admitting is that she can’t string conversational sentences together like she can in English — not even close. And here is where I realized where I had messed up. Back in February, Camila was accepted into a fabulous dual immersion program in Spanish. That day was full of excitement, but also of a sense of relief that I could finally relax with the Spanish exposure. Meaning, my husband and I still talk to her only in Spanish, but we now allow television and music in English; we no longer translate the books we read out loud to Spanish; and we got lazy about asking her to respond to us in Spanish. Aside from that, her pre-school was in English — because we had no choice, — so her exposure to it was vast and her language of play became English. Now, faced with the realization that she’s not truly as outward and expressive bilingual as I thought, I wonder if I did her a disservice or if it will all really come to her once she starts kindergarten next week? I’m sure it’s all in her, and maybe I’ll be surprised by the end of the week when she’s had plenty of immersion and her Spanish would have flourished again. Regardless, it’s been a good wake up call that this journey to true bilingualism requires plenty of attention and awareness, and that I need to follow my own advice a whole lot more. Please share with me in the comments, have you had a bilingual setback with your kids or yourself? How did you deal with it? Ana – thanks so much for sharing this openly! We haven’t had setbacks yet as our kids are only 2.5yrs old, but your post is a great wake-up call to continue putting in all the hard work we know we have to do. Raising multilingual kids is a full- time job! I understand the disappointment but I´d say that it is important to give your child time to adjust to her new, predominantly Spanish, environment. Even for someone who is fully bilingual like myself it can take time to adjust when you move back and forth between countries. When I go to the US it can take me quite a while to “re-route” my brain away from certain words and phrases I am used to using in Spanish. Same when I am in Latin America. Two days is not much time, especially for a child who is still in the process of learning both languages. According to my mother (who only spoke Spanish with me but also had to contend with my attending American schools, albeit in Latin America) when she brought me to Paraguay for a visit from the US at age 3 I spoke in English (or not at all) for several days before, in her words “a flood of Spanish came out, como si fuese que se abrió una canilla en tu cerebro (as if a faucet in your brain finally turned on).” Upon returning to the US we stopped to visit my American grandparents who exclaimed “Isn´t this girl going to speak English ever again?” and it did take a while for me to switch back to using both languages. So give it time! However you do bring up a good point about being lax in terms of Spanish exposure. Unfortunately, as you mention, your daughter is surrounded by English in the US and doesn´t have a need to speak Spanish. Although my mother spoke to me exclusively in Spanish I also heavily credit the fact that I lived in Latin America and therefore needed Spanish as a child as soon as I left my English-speaking school environment. 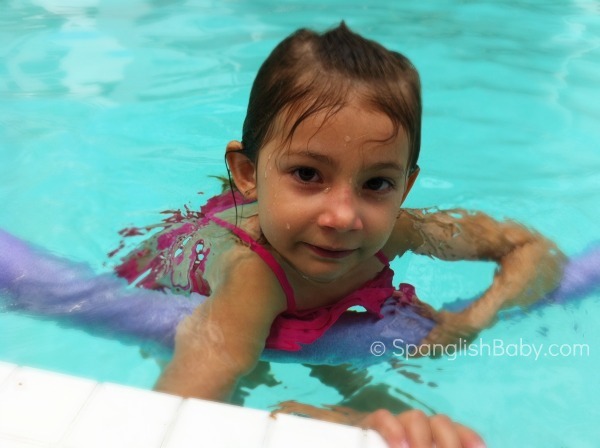 Finding that balance between Spanish and English exposure can feel like swimming against the current. There is especially a lot of pressure among parents (and I include myself) that grew up speaking both languages and may be more comfortable speaking English in certain settings (such as with their spouses, professionally, etc). When my children were born it took me months to feel comfortable speaking to them in Spanish. Though my husband and I both speak Spanish it is taking us a while to re-train ourselves to speak to each other in front of the kids in Spanish – the tracks for our relationship were laid down in English so it is quite difficult! I´m hoping that we are going to be able to make the switch by the time we move back to the US but I don´t expect any of it to be easy. Many thanks for your support of parents everywhere struggling with these issues! The last time we traveled to Colombia was when my older boy Gabe (now 5) was 8 months old. I consider Gabe’s bilingualism to be very impressive and he hasn’t shown me any resistance to speaking Spanish yet, other than he very comfortably will fill in with English words when he doesn’t know the Spanish word or when he’s too lazy or tired to think about it. But one thing I’ve noticed is that when we Skype with my family in Colombia, he becomes very shy and quiet. I assume this has something to do with the fact that he hasn’t seem some of these people in person, ever (though he does see them on Skype at least every two weeks) but I am also very conscious of the fact that the way my family speaks Spanish is very different from how I speak it or from the Spanish he hears at daycare or in our neighborhood (which is predominantly Mexican Spanish). So my family will ask him simple things like “what have you been up to,” but when I examine closely the terms and words they use, I realize are expressions he may not be familiar with. Long story short, I wonder if your girl might not be overwhelmed and self-conscious by being in an environment where everyone speaks Spanish so fluently, so fast, and probably so filled with regional expressions and manners of Speaking, that she takes refuge by just refusing to speak Spanish. One last note: When I arrived in this country at the age of 20 and having a decent command of the English language, I was TERRIFIED to answer the phone because I felt like I could only understand about 50% of what people were saying. It took me about 6 months for true “bilingualism” to kick in – that is, for my brain to stop having to translated and truly be able to think in Spanish. Don´t lose heart. She’ll get there. Ufff, nosotros hemos tenido muchos set-backs.. yo llegue hace 9 años a EEUU y solo hablaba español, así que por varios años hablamos inglés en casa para que yo aprendiera. Horror!!! Ahora mi hija de 7 años entiende todo en español, pero habla casi solo inglés, pero lee en español sin problemas. Yo creo que es una cosa de confianza y necesidad, y como tu hija, ella se da cuenta que puede ser entendida en inglés, para que complicarse. Muchas veces me cuestiono como hemos llevado la preservación del idioma español en nuestra familia y ahora con mi hija menos (3 años) hemos vuelto a solo hablar español en casa, pero ambas nos contestan en inglés. Ana, I think it takes courage to recognize any of our children’s imperfecciones. But. It takes great courage to admit them to ourselves. More importantly, finding what went wrong and finding solutions is really what matters. I think you are at a great advantage that your daughter is going into dual immersion program in a few weeks. If anything, I think a little more patients is what will be needed from you and from her as she adapts to a new way of learning. I do think she will be fine, and magnificently bilingual, esp. with all the opportunities you present her AND her new school program. As for us, we speak Spanish and French at home. Just this weekend, I told my mother-in-law that if our children stop learning/speaking French it was my husbands fault because he recently started talking to them in English. She agreed. I continue to talk to them in Spanish and do not respond if they talk to me in English. We read and watch videos in Spanish or French when we can. As my oldest gets ready to start Kindergarten in a few weeks, our biggest dilemma is which school? In-district regular school or out-of-district dual immersion in Spanish? The in-district school has just finished being renovated vs. the dual immersion program school has just been designaged Title I. Being out-of-district makes school transportation our biggest dilemma because we do not have the community/neighborhood support that we have in our district school. It may come down that we will not enroll her in the dual immersion program because of this. : ( I am heartbroken. As a mom, my goal is to provide our children with the best opportunities and I am falling. Best of luck to Camila this school year!!! Ooops. Last word is FAILING. Great comments from other posts and good stuff to keep in mind. Kids are also different. My less verbal to-be-first-grader-at-spanish-immersion never really had a problem switching between Dutch at home and English in daycare/preschool but he was very late with language development (to the point we didn’t think spanish di was a good idea/it turned out fantastic). However, my second kid has a much easier time with language and talking in general but I notice he has a much harder time switching between Dutch at home and English at daycare/preschool. With Dutch-only kids he also had a tendency to speak back in English (with little boys that doesn’t seem to matter much). I have noticed repeatedly that the weeks *after* the trip, the four year starts to speak Dutch-mostly more and more. It’s as though there is some incubation or something. It’s weird and surprises me each time. I now also figure there is a huge difference between between being verbal and language learning. Also, it’s interesting to me that my older one is less verbal and more perfectionist yet is totally un-selfconscious about his language skills. This is super cool and totally unexpected. The four year old who in general speaks well does says stuff like ‘i can’t speak dutch’ *in* dutch. My current thoughts are that language comes so naturally to the younger one that when he has to put in effort, he notices and attributes the effort to ‘not being good in dutch’. The older one puts in effort to speak anyways so it doesn’t really matter to him whether it’s english, dutch or spanish. Note: I am very much looking forward to finding out from your blog entries how spanish di works out from a spanish-at-home perspective! Any chance she has abuelitos who don’t understand English? (Or can pretend not to?) … Maybe if she spent a few weeks with them, that would get her jump started. It’s really hard to admit that one’s child isn’t fully bilingual when it’s something so important to you – it makes me a little heartsick sometimes. And to admit that we, as parents, are partly at fault, isn’t a good feeling either. Hopefully dual immersion Kindergarten will help but she will be surrounded by plenty of English speakers so it’s not a full immersion experience where she’s forced to speak Spanish to survive. Clever Camila will probably continue to find ways to avoid Spanish when possible. Sounds like it’s time to break out that action plan of yours that you wrote when she said she doesn’t speak Spanish. Interesting article. I guess us non bilingual parents arent alone in our struggles to raise bilingual kids. I am always envious of families who are bilingual, thinking their kids have it easy learning the language. It’s good to get the perspective that you are all working hard towards the goal as well. It’s a good reminder to me to stay the course as it will be worth it in the long run! When we got to mexico this year, I was surprised with HOW much spanish my oldest daughter Celia spoke after 3 years at Franklin. She spoke ONLY in Spanish, and talked to all her new friends and family in Spanish only with EASE. My younger daughter right out of Kinder also spoke, and although she didn’t speak as well, and was shy, she was amazing. And this is with barely any prior exposure to spanish for her first 5 years of life! Ana, you’ll see how Franklin will really help her language acquisition and her willingness to speak with others. I’m sure of it. Keep doing what you do, and she’ll be way ahead of the game. A great article, thank you. We are a French-Finnish family living in Finland and my French husband has a brother who lives in Sweden. We have been quite passionate (obsessed might be another word…) about our children’s French, they go to a bilingual school and spend summers in France with the grandparents. Their cousins, however, don’t and also reply in Swedish to their father even if they understand everything in French. When they all meet in France our girls speak French, but the cousins reply in Swedish. However, just like you mention in your case, they are very close and day by day the Swedish cousins switch more and more to French. We’ve noticed that the results of a trip to the minority language country are best seen about two weeks after returning home. This would coincide perfectly with the beginning of your daughter’s bilingual school so I’m sure you’ll see results at that point and that she will want to talk to you in Spanish about things that she has experienced in that language at school. After the school year, how about letting her stay alone for a while with the cousins and your sister-in-law’s family? My daughters were both six when they first flew to France as UM and while it’s really scary (especially for mommy) the first time, it has made all the difference not to have me (=Finnish speaker) there. It really tips the scale in favor of French and they’re also less self-conscious about speaking the weaker language. Its funny that I woke up this morning and read this article, because I had a scary dream last night that I was talking to my son (only 15 months) in spanish and he kept asking me “what does that mean?” in English. I think the fact that you care is #1. Most parents think raising bilingual kids is easy, you just speak the target language a little and they’ll get it because they’re kids and its natural for them. The more work I do with families the more I realize that learning a second language is just as hard for kids as it is for adults. I believe kids are just more patient and don’t complain as much about it. It always amazes me how families think about language and learning. I think us bilingual moms that care so deeply about raising a bilingual or trilingual family are so rare, but just like animal people, you can pick them out of a crowd. The fact that it bothers us so much if we think for one second they may have missed something in the target language is key. We have to be so vigilant every second. Second language learning or becoming fluent in a language other than the language of the culture you live in takes constant attention, especially for kids. Its not this magical thing that happens if you just teach them how to say hola and gracias and read them some Spanish books. I think what you are doing is great. The school will help a lot, but its like you said in the article, we cannot let our guard down. ¡Todos los comentarios son magnificos! I am learning so much from this post and I agree with most of the comments. Your vacation with primos sounds so much like my son’s vacation with his, he doesn’t want to speak Spanish, he tells me he is “too shy” so I let him be although I know he speaks Spanish in school since he has been in a wonderful immersion program for 4 years! I know his Spanish is in his brain and one day he will show it, for now I will keep up the fight! My boys (15 and 6) were born and raised until recently in Buenos Aires, Argentina. After several battles with chronic illness, my Argentine husband suddenly passed away just before last Christmas. Before that, we spoke only Spanish at home, since dad didn’t speak English, and we fell into that pattern of just one language. It was something I’d felt extremely guilty about (not teaching my kids English), but we recently relocated to the US and have been here since May. Since my 15 year old needed to start high school in August, I enrolled him in an intensive English school here in Salt Lake City, Utah where we live now. I think many parents, like me, feel like they should be doing more for their family’s bilingualism, but let’s face some facts. In my case, it simply wasn’t feasible or practical, mainly due to my husband and his family’s dynamics, to impose my native language on that family or my children. They’d never truly been exposed to other ways of life and cultures, and haven’t traveled that much, thus the cultural understanding for my roots simply didn’t happen as I wanted or expected. As a consequence, I have paid for, more like, invested in, very expensive language classes for my boys, to prepare them for schooling in English. I’ve been pleasantly surprised at how much they’ve progressed in 3.5 months, but it’s mainly due to the immersion in the foreign language, and because they NEED to interact and play in the new language. I wish you all the best in your language endeavors! Well, I’m raising two daughters right now bilingually, but we’re doing German (though my husband wants to start introducing Spanish now…) Anyway, I’ve been around a lot of other parents who raise their kids bilingual, and one aspect that certainly seems to play into language development in both languages is personality. My 3-year old daughter is EXTREMELY verbal. She is absolutely fluent in German (in fact, it’s her dominant language), even though Dad only speaks English with the kids, and we’re otherwise not surrounded by anyone who speaks German unless we do skype with relatives in Germany. I’ve been pretty strict with only speaking German with my kids, only German books, DVDs and so forth. But with other German friends who’ve done the very same thing, the outcomes have varied, and I honestly think personality is part of it. My second child doesn’t speak as much yet, but I can already tell that she seems to lean more towards English. The only thing I’ve heard to work to promote speaking in both languages is to honestly not respond to a child unless they ask/speak in the language you want them to. In other words, if your daughter does not speak Spanish back to you, it should be treated as if she has not spoken at all. I guess that sounds kind of harsh, but it also seems like basic behaviorism/reinforcement to me. Little children will learn quickly what stuff gets a reaction and what doesn’t. If they realize that they don’t get X, Y and Z unless they use certain words, they’ll start using those words. At any rate, no matter how things turn out, the scientific evidence for the benefits of bilingual education are endless. Thus, whether your daughter really ends up speaking Spanish, it will still have benefited her. And at the end of the day, understanding is the first step to speaking. If she can understand it, it will just be a small step to speaking. As she gets older, she may see the value, and the beauty of it and choose to start speaking as well. Definitely not a disservice! Thank you for sharing Ana. This summer (August 2012) I was in France with Elena (7) and Pablo (4). We live in NJ and raise our kids with French and Spanish. Several family members told me Elena has a “funny” accent when she speaks in French. Although I did not want to admit it, it is true. How do I deal with it? I know that Elena’s main language is English. My accent in English is also “funny”, since I am French. It has not prevented me to communicate with people here in the US, on the contrary. If our kids have funny accents in other languages, it will just be another opportunity for them to tell the story about how they were raised. Wow, I’m glad I’m not alone in this. I know it sounds awful, but I am starting to get worried, because you see my son story is completely the opposite, yet the same. We moved to the US a year ago when I married my husband. My son only spoke Spanish, he was 5 years old when we got here last September. My husband doesn’t speak Spanish, so I was speaking English after 5 pm and Spanish to my son the rest of the day. He started school in late November and it was kinda hard on him since he didn’t speak any English. Now, I was surprised that in January was doing so great, speaking English to his little friends, to my husband and everything was great. I was happy, my son was finally bilingual. My parents visited us back in May and he was able to speak to them in Spanish of course. Summer went by and I was as usual jst speaking Spanish to him, and he was also speaking Spanish to me. Summer was over, he is now a 1st grader. From day 1, after school he didn’t “switch” back to Spanish as usual. I didn’t pay too much attention to it. it’s been 2 months since he started school and now he doesn’t want to speak Spanish to me. I still speak only Spanish to him, and he answers back in English, when I ask him to speak Spanish to me he gets mad, he claims he doesn’t know, and I know he does!!!! It is so frustrating, he speaks to my parents everyday on skype but now he doesn;t even speak Spanish to them. I really don’t know what to do, I can’t control the fact that he is surrounded by English. TV is in English, school is in English and that drives me crazy. I hope that now that my parents are visiting again and he will have his xmas break he will speak more Spanish. But it is hard, frustrating and discouraging. Give your son time to adjust to his new environment. Obviously he’s playing in English, so he’s adjusting to that. My first-grader has gone almost completely into English mode after speaking only Spanish in Argentina, and we’ve now been here in the US for over 6 months. If you want to preserve both languages, you can check out bilingual books in your local library, play songs in Spanish and sing to him. There are also bilingual sites you can subscribe to that will work on both languages. When your parents get here, I’m sure he’ll speak to them in their language (Spanish), but for now he thinks English is cool, since that’s his play language. That’s the way kids work, yet they won’t forget their native tongue. Calm down mommy, as things will work themselves out in the end. (English, Hungarian, and Slovak) and preschool is starting in the fall. I’m curious when English will surpass the Hungarian as their better language. It happnes much quicker than you expect. I was so worried she wouldn’t feel comfortable in an all-English environment, but it took her less than a month to make the switch. Thanks a loot for sharing this with all peopl you really know what you’re speaking approximately!